Barcelona and Real Madrid prepare for three battles, Paris Saint-Germain lick their Ligue 1 wounds and Higuain hits the ground running at Chelsea. 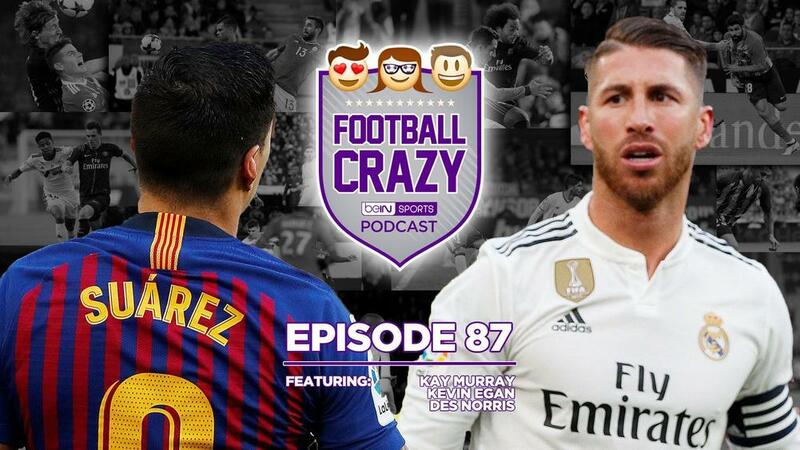 On this weeks Football Crazy, the gang gets braced for an epic trilogy of the beautiful game's most box-office derby, the prelude to which saw Lionel Messi saving the day for Barcelona yet again, while Real Madrid recorded a morale-boosting - and title race ground-gaining - win ahead of their midweek trip to the Camp Nou. Elsewhere, ol' milky veins himself, Alvaro Morata, drew a blank on his Atletico Madrid bow while Sevilla's miserable week was compounded with a loss to Celta. In France, Lyon took the sheen off Paris Saint-Germain's spotless Ligue 1 season, Cesc scored a winner and bucked the trend of Monaco new signings getting sent off, the Nicolas Pepe hype train gathered more steam, and Mario Balotelli's honeymoon period came to an abrupt end at Marseille. Over in England, Sergio Aguero tore Arsenal a new one, returning Heung-min Son carried the torch for Tottenham, the Solskjaer Effect took Man United to within two points of the top four, but the arrival of Gonzalo Higuain at Stamford Bridge might secure Chelsea the last Champions League spot, while the Goodison Park black cat strikes again! Elsewhere, debutants made their mark in the Turkish Super Lig, Dortmund slipped up but Bayern slipped up further, and Cristiano Ronaldo's goalscoring exploits may not be enough for some Juventus fans. Turning to things closer to home, Kev Egan bestows Gregg Berhalter's first two games in charge an 'A' rating and gives love to the much-maligned role of the USMNT holding midfielder.